Hey, Sunshine District do you know what time it is……………….? 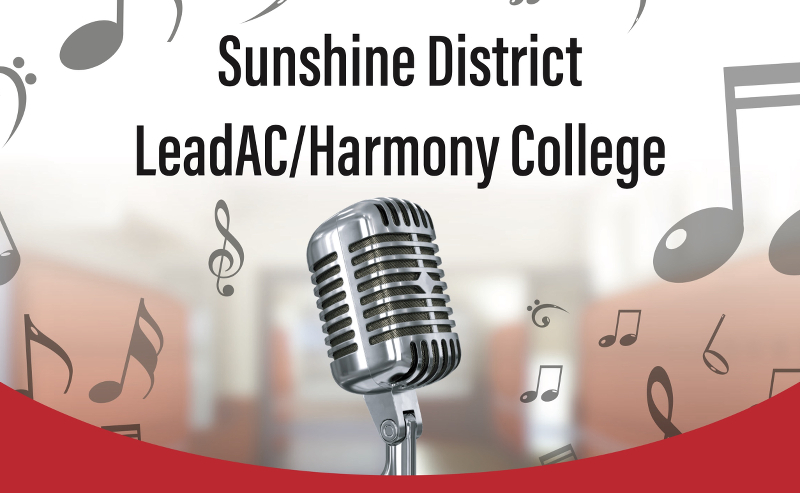 It is time to sign up for the new, revamped, exciting, and educational Sunshine District Leadership Academy and INTRODUCING OUR VERY OWN Harmony College. 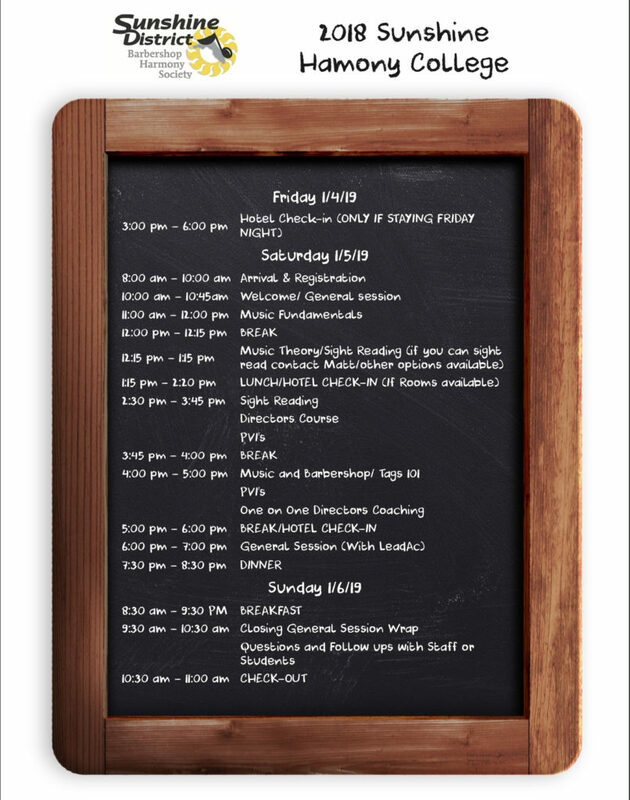 We have an exciting line up for everyone this year as we continue to try to grow our chapters, give our singers skills and knowledge to use on and off the risers, and be the society that truly has “Everyone in Harmony.” If that isn’t exciting enough we have also moved to The Rosen Plaza on International Drive in Orlando, FL and are offering the ability to sign up using Eventbrite. We hope to have a large turnout of excited, enthusiastic, energized members join us this year. If you have any questions, please reach out to me and let me help you and your chapter get engaged. Curriculum for LeadAc will have some major changes in it with the new “Everyone in Harmony” banner we are undertaking from BHS and with also include the Healthy Chapter Initiative. Everyone leading the classes will be up to date on the each of their given classes and how everything applies to them as we move to the new era of our society and ensure we as the Sunshine District stay out front and lead from within. Treasurer- Dave Kannberg – Dave will streamline his class with a questionnaire sent prior to LeadAC to each attending chapter to help preparation. Secretary- Sterling Warner – Sterling will have everything he needs to help our newer and re-attending secretaries know any new things arising for our new members whether male or female etc. President- BHS Rep – BHS rep will spear head this class as our Presidents will take most of the questions and need to support other board members. Membership/Marketing- Michelle Niec – Former BHS rep and employee she brings a good set of skills for training our chapters in how to grow, and retain our membership and she will add a little marketing into the membership course. As, often right now they go hand in hand. Marketing isn’t strictly a show promotional need. The overall goal is still the same for the new LeadAc/Harmony College. To become a successful, self-sustaining program in the Sunshine District that helps our members become the strong singers and musicians they were meant to be. Dr. Don Campbell (Dean of Directors College at HU) – Dr. Campbell will teach Music Fundamentals/Music Theory along with David Mills should our class grow that large, but his main goal is to help any of our directors who come and want some help with directing by providing a class and some one on one instruction to each director that attends to help them become more secure in their skills as they lead our choruses. Bruce Cokeroft – Bruce being an accomplished musician in Nashville with the Nashville singers, producing and writing music, not to mention his deep roots in barbershop being Gene’s son will be conducting some of our private voice instruction session. Shane Scott – Shane being a seasoned HU facility member will be assisting us with various classes. He will be helping with private vocal instruction, a tag class tied in with membership class, and help with some quartet coaching should we have some strong interest. There is an option for students who want to come on Friday and stay but does not include any sort of meal. 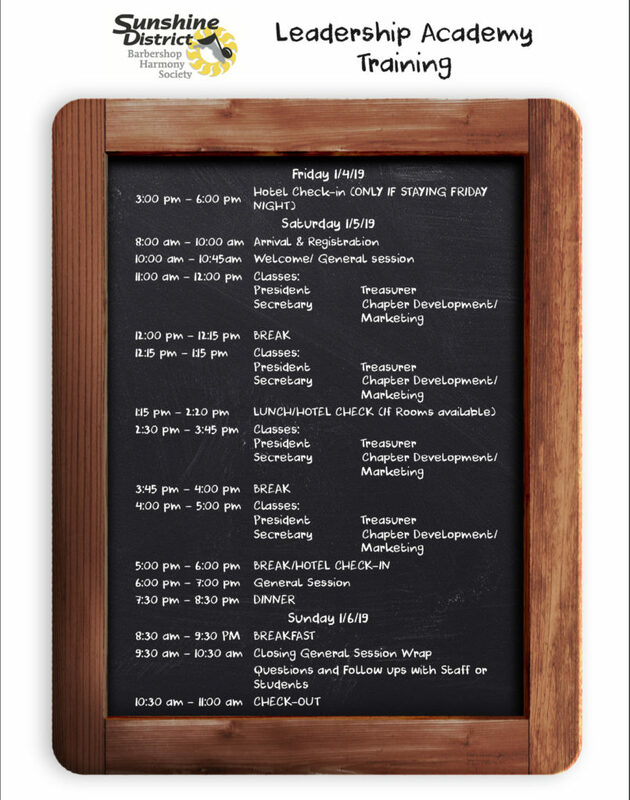 Meal plan is strictly for Saturday/Sunday. Cost is $365 for a single and $260 for a double.